9 mm thick glass-5.2g/cc gives optimum protection and tungsten alloy syring shield is easily replaced. Fully exposed needle hub allows you to visually check for correct venous insertion prior to injection. PET Pig syringe shield allows the safe transportation and administration of unit dose PET radiopharmaceuticals. The “T” handle on the PET Pig cap allows the unit to be easily lifted out of traditional “ammo can” delivery cases. The syringe shield use of the thermos style handle reduces hand exposure by permitting the PET Pig to be carried to the imaging suite without holding container sidewalls. Prior to injection, the base unscrews, allowing the center portion to be used as a syringe shield. When placed in the optional PET Pig Cradle, patient administrations can be performed with ease and maximum shielding. The PET Syringe Shield magnetically docks with the PET Dispensing Pig. Designed to accept 3cc and 5cc B-D syringes, syringe shield places the needle inside the vial septum when engaged; the external calibration rod allows the precise volume to be withdrawn without a leaded glass viewing port, where high exposure levels cannot be adequately shielded. 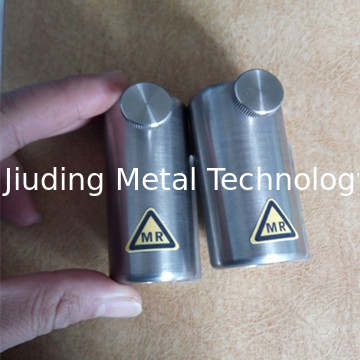 We can provide all kinds of tungsten alloy syringe shield as your requirement. Tungsten heavy alloy syringe shield is our leader products.